Homeschool Calendar days stopped at our home when we moved and lost our schoolroom. We just didn’t have room for our cute bullentin board with the daily calendar. I decided to create a calendar notebook for my little ones. I included all printables geared towards PreK-4th grade in one easy document, so print what you need. There are over 60 pages to pick and choose from depending on the age range of your children. 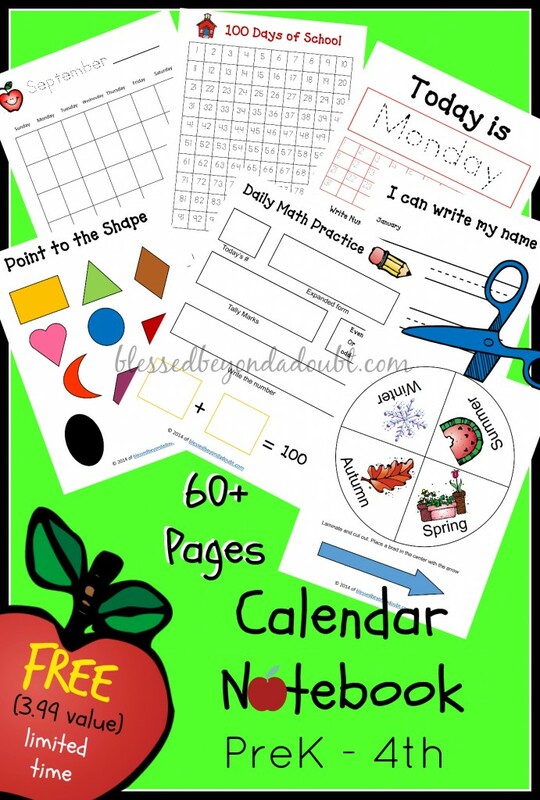 I am offering this homeschool calendar notebook pages FREE for a limited time to all my email subscribers. Not a subscriber yet? No problem, just fill out the form below and receive the homeschool calendar printables via email. Please check your spam folder. Have FUN with the homeschool calendar notebook pages! I subscribed to the email newsletter, but am unable to get the FREE Homeschool Calendar Notebook – PreK-4th (3.99 value). It says it will be out in the August 8th weekly newsletter, but since I just signed up, I didn’t get that. How can I download a copy? BTW – I’m new to the site and loving it! Thank you for all your handwork in putting these materials and ideas together. You are in the system. Did you not get the big list of freebies after you subscribed? How long does it take to get the confirmation email? Subscribed about 20 minutes ago and i am still waiting! Your calendar notebook is just what i have been looking for! Hi! This looks awesome. I am also not receiving the confirmation email. Please check your spam folder. SOmetimes it takes a couple of hours. Let me know if you are still having issues. Thanks!